Featuring Elvis' GRAMMY Award winning gospel music. 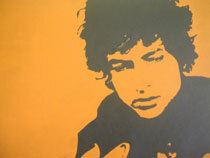 No artist in our time has mastered as many genres of American roots music as Bob Dylan. In a career that has spanned four decades, he has created masterpieces of traditional folk, protest music, folk rock, rock & roll, country, gospel and blues; in each he has pushed the envelope, using elements of older forms to synthesize a remarkable body of work that has made him one of the 20th century's most influential artists. A change of direction came in 1979, when he announced he had become a born-again Christian, and began to focus on gospel music. He has recorded no gospel music lately but is still touring, creating new songs for new generations.